Copyright: © 2018 Felipe AS Abreu, et al. This is an open access article distributed under the Creative Commons Attribution License, which permits unrestricted use, distribution, and reproduction in any medium, provided the original work is properly cited. Method: A search was performed in NCBI’s PubMed database for stereotactic or neuronavigational canine brain biopsy publications and articles which met at least one of the inclusion criteria and not any of the exclusion criteria were selected. The inclusion criteria were: 1) assessment of the specificity of the biopsy, 2) assessment of system accuracy, 3) assessment of the biopsy results, and 4) duration of the procedure. Results: Only one article met all the inclusion criteria. Eleven articles that partially met the criteria were used for comparison. Authors used different stereotaxic methods and two used neuronavigation equipment. The authors of the stereotactic studies either adapted devices from human medicine or developed their own devices; the level of accuracy was variable (errors of 0.0 mm to 5.1 mm), and the two articles that used animals with spontaneous lesions had a diagnostic specificity rate higher than 90 percent. The accuracy of the neuronavigation studies was approximately 3.3 mm; however, no live animals were used. Conclusions: It was not possible to properly compare stereotactic and neuronavigation techniques. To do so, the methodologies and the assessed parameters need to be standardized. Along with the increase in dog lifespans over the last decades, the number of canines diagnosed with neoplastic lesions also grew. The prevalence of intracranial neoplasia in dogs is 14.5 per 100,000 animals . Even though magnetic resonance imaging (MRI) and computed tomography (CT) scans have high sensitivity to diagnose neoplastic brain disease, they have low specificity to determine the type of neoplasia [2-5]. Only histopathological exams can identify the nature of the lesion seen in image studies . Brain tissue biopsies are delicate procedures and different methods have been proposed: free-hand [6-9], ultrasound-guided  and, more recently, with the aid of stereotactic [11-19] and neuronavigational devices [20-22]. The stereotactic method was developed in 1908 . It is based on drawing three-dimensional diagrams of the brain using coordinates X, Y, and Z (measured in millimeters) and locating anatomical reference points (auditory canals, midline and lower margin of the orbits). To establish a relationship between the cranial reference points and the structures of the CNS, stereotactic atlases were developed for some species [23,24]. With the advance in CT and MRI technologies, stereotactic devices and techniques started to be developed for brain biopsies (Figures 1 and 2). Figure 1: Stereotactic equipment developed by the authors. Cadaver dog head being positioned in a bite plate and secured with straps. The two acrylic cylinders in the left are the base where the needle arm is mounted. 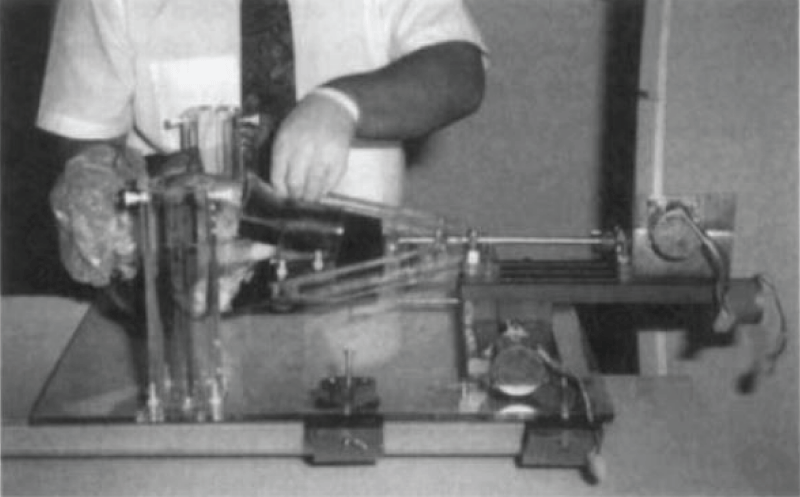 This device has a torsion axis (metal rod connecting the bite plate with the motor on the right) that rotates the dogs head to make the desired entry point perpendicular to the needle. All parts are kept in constant distance from each other because they are all connected to an acrylic base. (Reproduced from: A new device for stereotactic CT-guided biopsy of the canine brain - design construction and needle placement accuracy - Giroux A, Jones JC, et al.- Vet Radiol Ultrasound. 2002; 43(3): 229-236 – John Wiley and Sons License). Figure 2: (A) Dynatech device. This device has an acrylic base and acrylic support for the metal parts: a bite plate in the center, with two parallel rods on the sides, which holds the micromanipulator (in the left side of the picture) and the ear bars (on both metal rods). The detail in the upper right shows a dog positioned in the device. (B) Modified support for larger dogs. The device is similar to that shown on (A), but the acrylic support adds the possibility of moving the metal rods near of further from the bite plate, accommodating broader head dogs. The detail in the lower right shows a CT scout of a dog positioned in the device. (C) Micromanipulator with biopsy needle. This system allows the needle to be moved along two axis and also has angle adjustment. The detail shown in the arrow is the connection between the micromanipulator and the needle arm (Reproduced from: Frame-based stereotactic biopsy of canine brain masses: technique and clinical results in 26 cases - Rossmeisl JH, Andriani RT, et al - Front Vet Sci. 2015; 2: 1-13 – CC 3.0). A more recent technique, neuronavigation, has also been tested in dogs [20,21] and sheep . In this method, instead of affixing a rigid stereotactic device to the head of the animal, either CT-scan or MR images are imported to a computer, and the animal is immobilized in front of a set of infrared cameras that capture the spatial location of specifically developed instruments in real time, overlapping their position with previously imported images. The objective of this review was to compile articles about stereotactic and neuronavigational brain biopsies in dogs, compare the results, and determine whether, for the purposes of veterinary medicine, either individual technique yields superior results. A review of published articles about brain biopsies in dogs was conducted, focusing on the techniques including: free-hand, ultrasound-guided, stereotactic or neuronavigation. Using PubMed, the search of the MeSH terms "brain", "biopsy," and the Boolean operator "and" produced 4,529 results. Using the automatic filtering system of the website, only veterinary articles were selected, which reduced the number of articles to 284. We reviewed these articles searching for the criteria of inclusion and incorporated relevant articles in terms of quality and comparative attributes if they met at least one of the criteria. Only one article met all four inclusion criteria. Another 11 articles which are included in this review dealt directly with stereotactic or neuronavigational canine biopsy methods, met at least one of the inclusion criteria, and did not meet any of the exclusion criteria. Even though these articles failed to meet our original inclusion criteria, our goal was to compare the available data and identify areas requiring further study. The 12 articles selected and the inclusion criteria they met are in Table 1. Table 1: Assessment of the Studies that Meet at Least One of the Inclusion Criteria. * ST: Stereotactic; NN: Neuronavigation. Table 2: Stereotactic Equipment Used. Two articles used the neuronavigational device Veterinary Brainsight™: Chen et al. and Taylor et al. [20,21]. Of the authors who used live animals, only Koblik et al. , Moissonier et al. , and Rossmeisl et al. biopsied spontaneous lesions. Flegel et al. and Packer  biopsied healthy animals but cataloged adverse effects of the biopsies. The most common adverse reactions were hemorrhage at the site of the biopsy and seizures after the procedure, varying from a single episode to permanent sequelae. Several animals were euthanized, which prevented further analysis of the natural outcomes of adverse sequelae caused by the biopsy procedure. In addition, the authors reported on the worsening of the neurological symptoms and on the presentation of new symptoms. Of the animals who suffered adverse effects, six died, four of which were euthanized. Eight articles evaluated the diagnostic accuracy of the different biopsy methods: Koblik et al. , Moissonnier et al. and Troxel and Viti , determined the accuracy of the system as an average ± standard deviation. Taylor et al. , Squires et al. , and Rossmeisl et al. expressed system accuracy as an absolute average. Chen et al. expressed it as an average and maximum error of the series. Giroux  expressed it as the percentage of correct placement on the target. Biopsy values and methods are summarized in Table 3. Table 3: Biopsy method and system accuracy. * Maximum error value in parenthesis; † Percentage of hits at the caudate nucleus and hypophysis, respectively. Only two articles compared the results of the brain biopsies with the results of surgery or necropsy (Table 4). * Percentage of agreement between the biopsy and surgery or necropsy. Number of biopsies in the article in parenthesis. Table 5: Duration of the biopsy. - Not reported; * Average time with experience; † Duration of the exam without CT-scan after the biopsy/duration of the exam with CT-scan after the biopsy. Squires et al. reported only the time it took to position the stereotactic equipment on the cadaver, perform an MRI and calculate the trajectory of the biopsy. According to Moissonnier et al. and Moissonnier et al. [3,4], each biopsy took 60 min. Their time is lower than that reported by Rossmeisl et al. , whose biopsy times varied from 84 to 118 mins for exams that did not include a CT-scan after the biopsy, and 117 to 190 mins when a CT-scan was conducted post biopsy. Procedures performed by Koblik et al. took from 90 to 240 mins and those performed by Packer et al. , took from 95 to 245 mins. Flegel et al. [14,] took 150 mins to perform each biopsy. Despite great advances in the past few decades in terms of availability of complex diagnostic imaging methods such as CT and MRI, the lack of accurate diagnoses for brain neoplasia confirmed through histopathological exams often prevents specific treatment tailoring. Only two studies measured the diagnostic accuracy of the brain biopsies, but both yielded the final diagnose on more than 90% of the cases. Radiotherapy has become widely available along with advances in intracranial surgical techniques, critical care and chemotherapeutic drugs and protocols and offer treatments that result in better recovery rates or longer remission times. It is extremely important to rationalize the use of these resources. Systematic reviews and meta-analyses are considered the best decision-making tools to determine which therapy to adopt  but, during this study, the lack of articles and the absence of homogeneous methodologies hindered comparisons. The main problem involving stereotactic brain biopsy is that until recently there was no commercial model suitable for cats and dogs of all sizes. Several authors adapted commercial human models or developed their own stereotactic system. This large equipment variability in veterinary research creates different levels of method precision. Leksell's stereotactic equipment was the only one to have its accuracy tested twice, but in different species: dogs  and pigs . Even though these studies used the same equipment, the difference in precision was significant. Average errors ranged from 0.45 mm  to 2.5 mm  more than 5 times higher. Discrepancies may be because of the different species but can also reflect the quality of specific device adaptations made in each study; differences in the type of material used, type of finishing, meticulousness of the fittings, and other characteristics may impact the level of precision. Kopf's equipment is only approved for use in research tests  and not clinical use which may affect the precision standards it is held to. Though the time required to perform a biopsy may be affected by instrument adaptations, it can also be influenced by user experience [18,19]. Squires et al. only took 19 minutes to complete the biopsy. Koblik et al. and Packer et al. took as long as four hours to perform a single procedure. The one study that used commercially available veterinary stereotactic equipment was conducted by Rossmeisl et al. . Although these authors used two different equipment in the same study, the only change was the inclusion of lateral movement to the bars that sit next to the head, so it could fit larger dogs. Compared to other models, it had an intermediate level of precision (average error of 1.55 mm) . The assessment of the adverse effects resulting from the biopsies is not standardized either, making it difficult to draw conclusions about which complications are most significant and their average duration based on site and type of lesion. Cardiac changes were reported in only one article , likely because this was the only author to assess this parameter. Flegel et al. and Squires et al. biopsied healthy dogs but the authors did not describe the adverse effects thoroughly. Evaluation of adverse effects in dogs with spontaneous brain lesions can be particularly challenging. Brain tumors can have significative differences in prognosis and clinical signs based on its type and location. A parietal superficial meningioma has a much better prognosis than a thalamic gliobastoma. It is also very difficult to separate possible long-term adverse effects with the natural progression of the disease or the added possible adverse effects of chemotherapy or radiotherapy. Koblik et al. , Moissonier et al. and Rossmeisl et al. had morbidity rates of 12%, 26% and 37%, respectively. In humans the morbidity rate is lower: 6% in 500 patients submitted to stereotactic biopsies guided by MRI . All studies that used neuronavigation to plan biopsies measured the needle accuracy dogs [20-22]. Despite using distinct species and different imaging techniques, this was the most homogenous group in terms of precision. The maximum error reported in these studies was 3.60 mm . In humans, stereotactic and neuronavigation techniques have similar values for accuracy, morbidity, and mortality , but based on the articles reviewed and the research assessed, it is currently impossible to adequately compare stereotactic and neuronavigation techniques in veterinary medice. To adequately compare these methods, authors would have to conduct studies with an agreed upon control methodology. Based on this review an "ideal" study to assess brain biopsies in dogs should: use live animals with spontaneous lesions, specify the type of biopsy (stereotactic or neuronavigation) and the device used, measure the time taken to perform each step of the procedure, measure the accuracy of the system, compare the biopsy with the anatomopathological diagnosis whenever possible, and carefully assess the possible adverse effects of the brain biopsy in the immediate and short term. Atallah AN, Castro AA. Revisão Sistemática e Metanálises [portuguese], in: Evidências para melhores decisões clínicas. São Paulo, SP. Lemos Editorial 1998; 20-28.